Omg, super crispy fritters,makes me drool..
Yummy fritters, a similar one is prepared down south in Kerala. What a lovely way to enjoy Banana as a dessert! Lovely presentation. I love the props you use for the clicks btw.Thanks for sharing the recipe. delicious and crispy fritters !! super tempting and crispy fritters..
WWHich part do these banana fritter come from ??? Never heard of them..I only know banana chips, kelavada...:) This is complete different and new..
i love these a lot....I used to have it in an malay rest. I didnt know that original name...they look tempting! 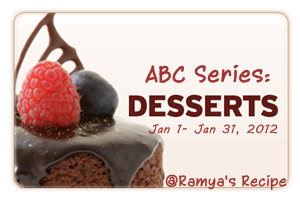 Sounds yummy with icecream.Thanks for linking to CEDD event. Yummy snack, can be eaten without sugar too! Mm, I've been craving some banana fritters for a long time! ^^ These look especially delicious! My favourite snack, looks very delicious. This is what I always order for dessert at a thai restaurant. Love this recipe!!! Mouthwatering here, wat a terrific and super tempting recipe..
One of my favourite all time pudding! Yum. These were fabulous! I loved snooping around you blog and I can't wait to try more of your recipes! Made these last week. So nice.